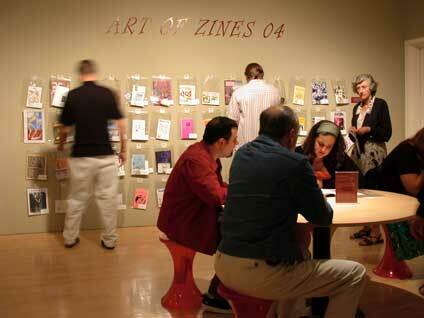 The 4th Annual Art of Zines exhibition is currently on view at the San Jose Museum of Art. Hundreds of zines from around the country and abroad are available for you to peruse. The exhibit runs concurrently with Nothing Ever Happens, the solo exhibit of Yoshitomo Nara  one of our favorite international artists. Also coming up on September 11, 2004... The Whys and Hows of the Zine Revolution. Join zine makers and readers for an informative and creative afternoon of dialogue, zines, and film. All of the events investigate the whys and how-tos of zine making and explore its evolution from an exclusively underground medium to a more widely-embraced popular culture phenomenon. Take a break and check out the latest zines, sold by the zinesters themselves. A cultural analysis of what causes zine makers to tick; what the hell zines are, why people make zines, the origin of zines, the resources and community available for zine makers, and the future of zines. Interviews with about 70 zine makers, ex-zine makers, and readers from the northwest. Featuring footage of the Portland Zine Symposium, other zine related events, and activities bringing zine culture to life. An original documentary with over 64 hours of footage for people with a new interest in zines as well as pros and novices. The video sparks untapped creativity and new interest into zine making and reading. Artwork by Cristy Road and music by J Church and Defiance, OH! Created by Basil Shadid, Rev. Phil Sano, Nickey Robo, and Joe Biel - Microcosm Publishing.